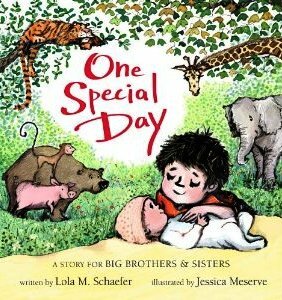 One Special Day: A Story for Big Brothers and Sisters by Lola M. Schaefer, is one of those. It’s the story of Spencer, the most adventurous, the most rambunctious, the most boyish boy you’ll ever want to meet. Spencer is a free spirit; he’s tough when he needs to be, brave when he wants to be, and loud as heck when the mood hits him. In fact, he’s everything a hyperactive little boy should be…until the day his parents bring a new baby home. When they do, Spencer quickly gains one more boyish quality–and perhaps the best quality of all: He becomes a gentle, doting big brother. One Special Day is just a lovely book. 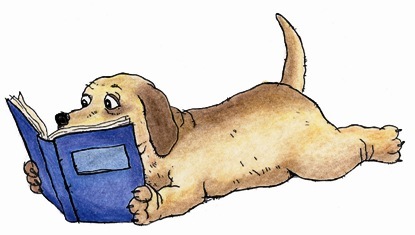 Schaefer uses short, simple prose to deftly capture the thoughts, feelings and hyperactive joys of young Spencer, and all the pre-kindergarteners out there who are sure to identify with him. This prose is complemented by the artistic talents of illustrator Jessica Meserve, under whose skilled and generous fingers we see every cartwheel, every rowdy stomp, and every tender smile on the faces of Spencer, his parents and his imaginary animal-friends. We see the quiet strength of a happy home; we see deep green grass, uncut and perfect for an imaginary jungle; and climb-able trees loaded down with hardy foliage. Full is what they are; full, the way Spencer’s happy life is full of love. Yes, I love every one of Meserve’s illustrations. But if I had to choose, I’d choose the very first picture, in which an unassuming Spencer waves goodbye to his parents (who are heading for the hospital) just before he turns a series of flips to celebrate being a boy; and the last two, in which Spencer exchanges his rowdy behavior for quiet time on a picnic blanket with his parents and the newest member of the family. Looking for the perfect “boy” book? You found it. Looking for a book about becoming a big brother? This is it. 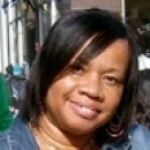 Looking for a book that celebrates the family and feeds the eyes with the best in picture book illustrations? This is the one. Get your own copy of One Special Day and everyday you read it will be the best day ever.